Western blot analysis of extracts from 293T cells, mock transfected (lane 1) or expressing CaMKII-α (lane2), CaMKII-β (lane 3) or CaMKII-γ (lane 4) using CaMKII-α Antibody (upper) and CaMKII (pan) (D11A10) Rabbit mAb #4436 (lower). 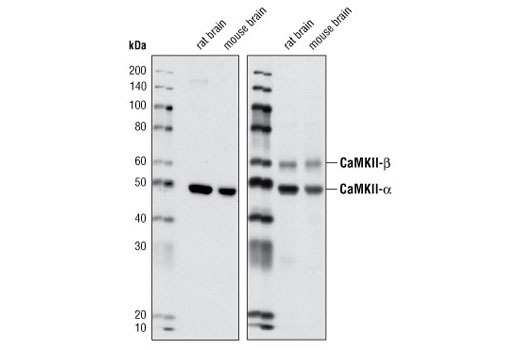 Western blot analysis of extracts from rat and mouse brain using CaMKII-α Antibody (left) and CaMKII pan #3362 (right). 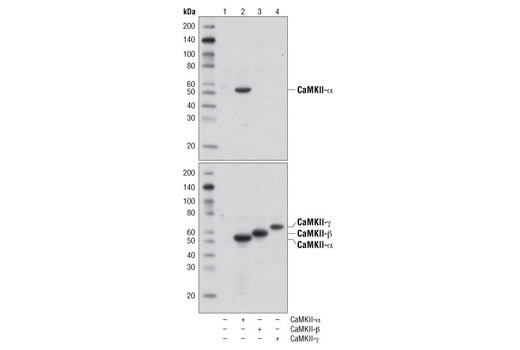 CaMKII-α Antibody detects endogenous levels of total CaMKII-α. The peptide sequence used as the antigen is not conserved in CaMKII-β, -γ and -δ.
Polyclonal antibodies are produced by immunizing animals with a synthetic peptide corresponding to the human sequence of CaMKII-α. Antibodies are purified by protein A and peptide affinity chromatography. CaMKII is an important member of the calcium/calmodulin-activated protein kinase family, functioning in neural synaptic stimulation and T cell receptor signaling (1,2). CaMKII has catalytic and regulatory domains. Ca2+/calmodulin binding to the CaMKII regulatory domain relieves autoinhibition and activates the kinase (3). The activated CaMKII further autophosphorylates at Thr286 to render the kinase constitutively active (3). The threonine phosphorylation state of CaMKII can be regulated through PP1/PKA. PP1 (protein phosphatase 1) dephosphorylates phospho-CaMKII at Thr286. PKA (protein kinase A) prevents phospho-CaMKII (Thr286) dephosphorylation through an inhibitory effect on PP1 (4). Hughes, K. et al. (2001) J Biol Chem 276, 36008-13. Barria, A. et al. (1997) Science 276, 2042-5. Barkai, U. et al. (2000) Mol Endocrinol 14, 554-63. Makhinson, M. et al. (1999) J Neurosci 19, 2500-10.